Charles Xavier, aka "The Xman," is a visionary producer, composer, electronic musician and percussionist based in the San Francisco Bay Area. 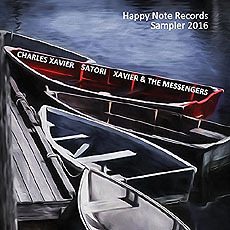 With a work ethic matched only by his creative madness, Xavier is releasing his sixth full-length album, Happy Note Records Sampler 2016, on October 14th, 2016. Xavier, the musician, and not to be confused with the mutant who possesses strong telepathy and arguably the most powerful mind on Earth ie: X-Men, brings us an incredible new compilation that spans 20 plus years of The Xman's releases. Featuring contributions from Satori, The Messengers, and genres including Jazz, Electronic, New Age and Ambient music, the album begins with the lush 'We Talk' before heading delightfully into the mid-tempo 'A Year's Past' and then 'Eye Witness News'. The latter chock full of real news audio, it takes a few listens to, to finally hear the song behind the "words", so to speak. Next up is light prog key sounds of 'The Dreamer' which in turn is followed by the gentle 'Into The Beyond And Back', the light, sultry Jazz of 'Hollywood And Heaven', and then my own personal favorite, the cigar bar Jazz of 'Stomp'n At Round Midnight'. Next up is the chill trumpet work of 'After Hours' which is backed superbly by both 'Perfect Mold' and triumphant 'The King Has Come'. The joyous 'So Alone' is another stand out highlight here on this Sampler, and that is followed by the thoughtfully precise piano work of 'I Sat Outside There', 'You Know You Know' and then the album wraps with 'Christmas Day Is Almost Here'. In the past 30 years, Xavier has built multiple businesses, was a key contributor to a million-dollar audio recording business, and has undertaken several endeavors in music. His own independent record label Happy Note Records is a multifaceted entertainment company promoting "Unconventional Music for Unconventional Minds." This album is, truly as good as it gets with regard his musicianship combined with those around him. Buy it today. You won't regret it.